Puoi selezionare fino a 14 viaggiatori in tutto. Scopri il passato sovietico di Riga mentre esplori i momenti salienti della città in questo tour di 3 ore. Scopri la storia della città e com'era vivere durante l'era sovietica. Assapora il cibo dell'era sovietica tradizionale mentre cammini per la città e goditi la vista panoramica. Questo tour per piccoli gruppi è perfetto per chi ama la storia sovietica e vuole uno sguardo più profondo sulla vita dietro la cortina di ferro. My husband and I were the only ones on the tour. The tour took us to areas of the city that we would never have been able to go on our own. First, we took the bus to the Corner House. From there, we crossed the bridge again, took the bus and saw some Soviet-era architecture. We later took the tram back to the city, and enjoyed the panoramic view from the Academy of Sciences this cost about 5 Euro and was not included in the tour price. The tour lasted about three hours total. What we enjoyed the most was the company of our informative and pleasant tour guide. She was very easy to talk to, and both my husband and I found ourselves asking her many questions not only about the Soviet era, but about Latvia and the Baltic countries in general. We had done the morning four-hour tour, but this heritage tour gives a glimpse of a different side of Riga. A fantastic day seeing the sights of Riga. We booked this and the Best of Riga Walking Tour on the same day and our beautiful guide, Liga, combined the two into an incredible day of sighseeing and food tasting! Would highly recommend both tours! This was a well informed tour of Latvia's history in the post war period. Our guide Liga took us to the important sites, the Freedom monument, the KGB building, the Soviet memorial, and t-to the bleak railway station where thousands of Latvians were deported to Siberia both in 1941 and then again in 1949. It was easy to imagine the utter despair as loved ones were transported east never to be seen again. The tour cost included a taxi fare and a bus ride as some of the monuments were a distance away but our guide Liga paid for these. She also took us to the iconic Latvia Academy of Science building also known as Stalin's birthday cake for a view over the old city. Finally we went for a drink in an old style Soviet cafe with prices to match - 3 drinks and a sandwich for less than 3! The tour lasted well over 2 hours and was excellent value for money. This tour was spectacular. 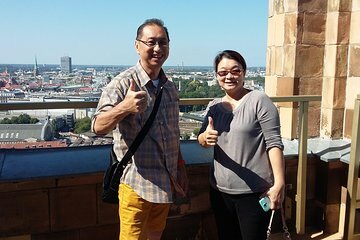 My sister and I learned so much about Riga's and Latvia's history from a Riga native. She also shared a lot of her own experiences and perspectives, which I found to be enlightening and rewarding. I highly recommend this tour!